There are quite a number of things to do in Bantul. If you are into nature and traditional way of life, you can definitely get plenty of Instagram-worthy photo at some of Bantul places of interest. Bordered by Yogyakarta city to the north, Sleman regency to the west, and Gunung Kidul regency to the east, Bantul is known as the birth regency of Indonesia's former president Suharto. Less developed than other cities around Yogyakarta, you can still see a lot of villages and villagers in this area. Natural attractions which you can consider visiting in Bantul are Parangtritis Beach (black sand beach) and Pengger Pine Forest. Bantul is also popular with turtles nesting between the periods of July & August. Parangtritis is a popular beach and village area on the southern coast of Java. It is also a popular spot for surfing due to the high waves. Dubbed “the black-sand beach”, you are able to do extreme sports here as well: ATV-riding & Paragliding. For some sand dune sandboarding, go to the nearby Gumuk Pasir Parangkusumo. 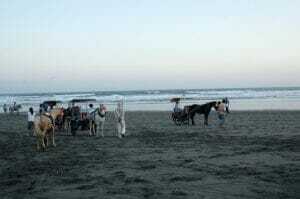 For the less adventurous visitors, try one of the most popular activities here: a horse-cart ride right on the beach! Check out our 4D3N Borobudur Temple Sunrise and Mount Merapi Tour that covers a visit to Parangtritis Beach for the mystical sunset. 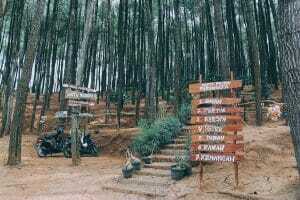 Located in the northern part of Bantul is Pengger Pine Forest. Here you are able to get Instagram-worthy shots involving nature and flora in particular. The huge pine trees, tree bridges, pyramid indian house and also the huge wooden hand are some of the attractions there. With tall pine trees everywhere, this is one of the most popular pre-wedding photo-shoot locations. For a tour that covers this forest, check out our 4D3N Yogyakarta Borobudur, Setumbu Hill Sunrise, Pine Forest, Sand Dune Tour. 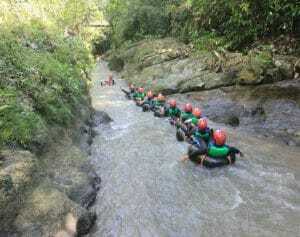 Located 30-min drive away from Yogyakarta city centre, visitors can experience Karst Tubing here. The setting is a simple: a river with massive Karst Stones on both sides of its walls, stready stream of water and numerous trees alongside it. Definitely one of the top things to do in Bantul! Pantai Goa Cemara, also known as Pine Cave Beach, is one beautiful beach. 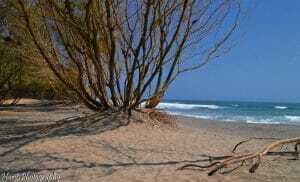 Like most beaches in Bantul, Pine Cave Beach has black sand & big waves. From Yogyakarta city centre, Bantul is approximately 20km away (30-40 mins). There are cheap public buses available from Yogyakarta to Bantul. However, as they tend to sell out pretty fast, it's recommended that you rent a car with driver. 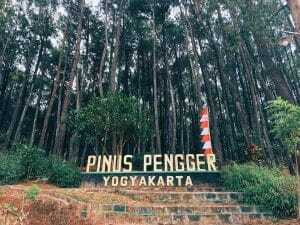 It would take around 1 hour to get from Yogyakarta city centre to Pengger Pine Forest and 1 hour & 3o minutes to Parangtritis.